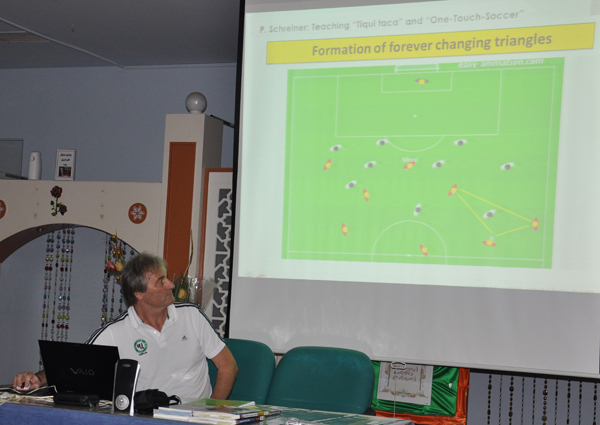 From 5th to 9th of November 2013 there was a soccer coaches seminar in Ajman at Al Hikmah private school. Managing director was Mohamed Afifey, who invited Peter Schreiner to come to Dubai and hold this seminar in Ajman. Coaches from Abu Dhabi, Al Ain, Dubai and Ajman came to this seminar to learn more about “Tiqui taca and One touch soccer”. Presenter was Peter Schreiner (Germany, former U19 coach of Schalke 04) who showed exercises and how to coach them and gave a lot of interseting information about teaching the ground pass and combination play. Drills for beginners, advanced and professonals. Imad Boutaraaoui, Dragan Sretenijevic,Paul Baker Kalanzi, Ian Fern, Neil Ormond, Ahmad Abdalkayom Abdulah, Faisal B. Tattan, Ahmed Mohamed Wahid Abbas, Ahmed Abdel Karim Abdel Fadil, Abd Allah Mousa Hamad Alsheblak, Anees Makrous, Mohamed Soubhi Abdel Hai, Nasf Ahmed Hassan Hussein, Aws Akram Yahya, Mohamed Hechmi Tangour, Suliman Elkasaby Elabasiry, Mubarak Mohammed Ali Alketbi, Ahmed Mahmoud Alattar, Tarek Bassiouny Aly Diab, Alaa Mohmed Gamal Abd Alhadi, Waleed Sultan Abdullah Mohammd, Tawfik Gamal Tawfik Zidan, Issam Aladawi Abdrabu Al Tanbuli, Mohamed Hussain, Hicham Hansali, Mohammed Humaid Alqama, Mohamed Mohamed Mahmoud Afifey, Samir K. Hassan , Nasef Ahmed Hassan Hussein, Mohammed Hussein Nassrullah.